Due to cost constraints, the project will not allow for construction of a new gym or expansion of the existing gym to allow for a stage. 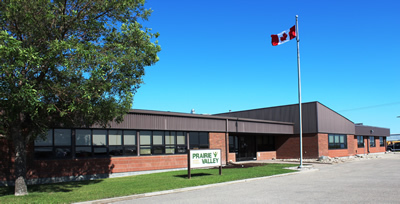 Estimated cost is $7.0M in total, with 100% of the cost to be paid by Prairie Valley School Division. We have requested and continue to work toward a provincial capital contribution. Phase 1 - Code and Safety Systems, New Construction of Elementary Classrooms, Mechanical Systems, and Renovations to the east portion of the school totaling approximately $3M. Phase 2 - Code and Safety Systems, Resource Centre, Science Room, Music Room, High School classrooms, main entrance, administration office, exterior finishes totaling approximately $4M. Stage 1 Plan and schematic design are complete, including several public and staff consultation sessions; detailed architectural drawings are also complete with the tender awarded to G. Hahn Construction of Fort Qu’Appelle. Phase 1 consists of an elementary wing addition and renovation and closure of the old primary building across the street from the main building. Phase 1 will be complete by July 2012. February to December 2012. Phase 2 work involves an addition for a student servery and common space near the gym and renovation of the high school wings; detailed planning will begin later this year.